Let Emily's help make your party planning easier. We offer lots of options, beginning with two complete party plans described below! Call 651-437-2491 to place your order. 10 pounds of shaved turkey breast and/or old tyme ham arranged on two trays. 12 dozen sliced silver dollar buns in white, wheat or pumpernickel. 3 gallons of Emily's homemade melon salad. 3 gallons of Emily's made-from-scratch potato salad or pasta salad. A decorated full sheet cake in white, chocolate or marble. 5 pounds of shaved turkey breast and/or old tyme ham arranged on a tray. 6 dozen sliced silver dollar buns in white, wheat or pumpernickel. 1 1/2 gallons of Emily's homemade potato salad or pasta salad. 2 gallons of made-from-scratch melon salad. Decorated 1/2 sheet cake in chocolate, white or marble. YOU CAN ENHANCE the above party plan menus by adding items from our party tray selections for an additional cost. Smoked ham . . $4.99/lb. Old tyme ham . . $5.49/lb. Turkey breast . . $6.49/lb. Roast beef . . $7.59/lb. Hamburger . . . $2.75/8 pk. Weiner . . . $2.80/8 pk. Silver dollar . . . $3.55/dz. Kaiser . . . $5.25/dz. Bratwurst . . . $4.95/dz. 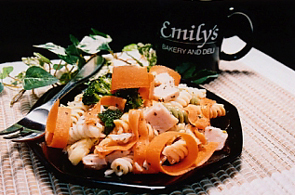 All of our salads are made fresh here at Emily's, with no added preservatives. If you want to add a little sweetness to your party, click here to check out our graduation cakes.